Tired of paying for premium numbers in the UK? A lot of people does and they don’t want to pay any extra for calling the customer service or to get their job done. WeQ4U Android app is here to help you out. There are so many companies in the UK and most of their customer service number starts with 0800, 0843, 0844, 0845, 0870, 0871, 0872, 0500 and more. 0800 numbers are free if you call from a landline. There are so many Android app to call the above mentioned numbers. Among all of them I like WeQ4U. 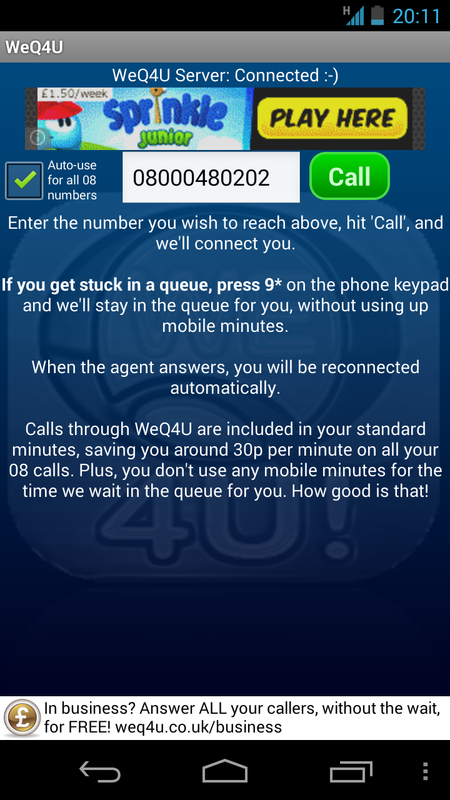 The app is very useful and saves you a lot of money if you call numbers starting with 08. Most amazingly this app saves you time as well. If you call those numbers another thing you know about staying on the line to talk to a representative. Sometimes the waiting times can be more than 15-20 minutes long. if you are not lucky. 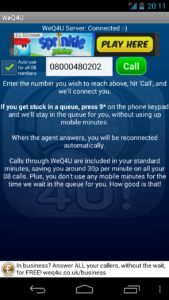 The app will wait for you on the line and calls you back when someone answers you call. Nice extra time if you are doing something. The app has two versions. One is free and contains advertisement. The other version is paid and without ads. The paid version of WeQ4U Android app costs you 2.95 from Google Play store. Where you can get all your Android apps for your device. If you are looking for the free version, get it from Google Play Store. It is very easy to use the app in your Android phone. If you just installed it you can open it up. There is a box for you to enter and dial your desired number. On the left side of the box there is a check box “Auto-use for all 08 numbers” ticked for you to make it more easy. If you dial any 08 numbers directly in your dial pad, the app will interact and if the dialed 08 number has any alternative numbers the app will take over and will let you call for free. But be aware that this is not completely free as it will use your mobile networks minutes. Better if you have a monthly contract, so you can use your minutes without paying any extra. When you press the call button the app will look for an alternative number in their database and will connect you. If you get stuck in the queue just press “9*” and the app will queue for you. They have millions of numbers in their database containing major UK companies and claims they have more numbers than saynoto0870.com, who has a huge database as well. Hope WeQ4U Android app will save some money for you and time as well. Let us know if you are using it and how much you like it.